Apple (AAPL) has been in a rising trend channel since late June when it was trading at $394. It’s gone up to $441 – a 12% jump, and is once again showing tendencies of further upside as the the name penetrates the upper band of the channel located at the $440 level. Apple has now resistance located at $450 & $457. Currently, there is no imminent sign of a reversal. However, a pullback below $430 puts the stock back within the channel, and a violation of the $419 level (check ticker’s ascending peaks in late 2011) indicates a trend reversal as well as a strong signal AAPL may nosedive to approximately $350 before it finds any real support. Trade the long side for now, but sell rallies into the mid-$450′s. 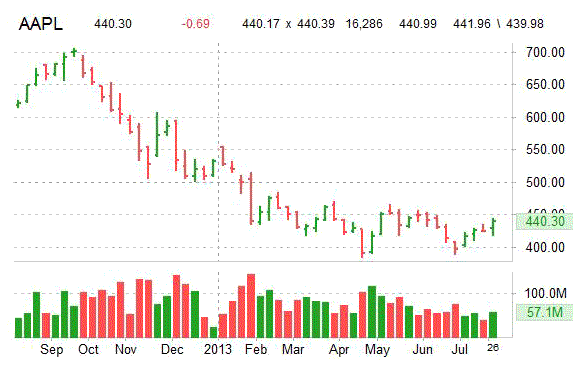 As we have reiterated before, the iPhone maker shares remain a strong buy below $400. Facebook’s (FB) stock soared more than 30% in early trading Thursday after the largest social media company posted results that exceeded Wall Street forecast for the June quarter on both revenue and earnings per share. The Menlo Park, Calif. – based social network said EPS rose $0.19, a nickel better than expectations, while revenue surged 53% from the same period a year ago to $1.81 billion. Analysts predicted $0.14 and $1.62 billion, respectively. Technically speaking, FB is now at the highest level since June 22, 2012. After holding above the intermediate ascending channel that it broke out of on Nov. 30. FB, which last closed at $34.36, has seen a steady uptrend above the $30 area and is getting within striking distance of the $38 IPO mark. 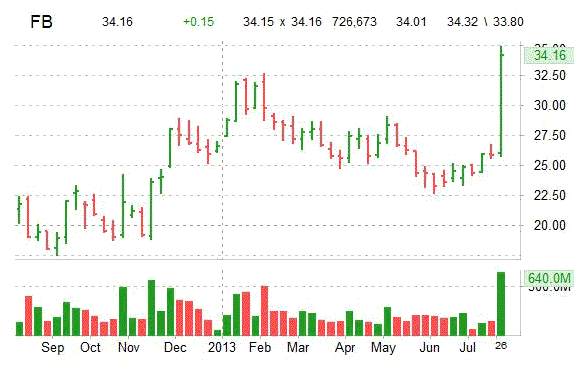 Look for the name to make it to $37 near-term, and then mid-$40s longer-term, which was the IPO high/May 18, 2012. Facebook is up 39% in the last month, up 9% in the last six months, and up $5.60, or 19.50%, since this time last year. Shares of Fleetmatics Group (FLTX) have seen a nice two-day bounce back above the $34 area with the name printing a fresh 52-week high of $39.95. Remains to be seen whether FLTX will hold the new floor as some digestion above $34.28 & $37.54 levels would be constructive for higher prices. Unless key support levels mentioned above are convincingly penetrated, the buy the dips strategy is still the higher probability trade. We think Fleetmatics’ next move up would be toward the $41.00 – $42.50 range on a short-term basis. Beyond that, look for a target of $44.00. 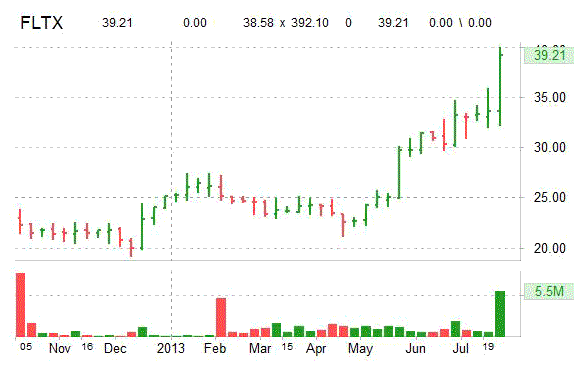 FLTX is up 15.36% in the last month, up 50% in the last six months, and up $14.28, or 58%, since January 2012.